Riviera Maya golf is one of the most relaxing sports you can enjoy while in the Riviera Maya Mexico. It may even be the reason you are visiting this Caribbean Sea masterpiece. Golfing in lush, green vegetation, the jungle or oceanside is the uniqueness of golfing here. Here is your golf guide to Mexico (at least the Riviera Maya). You can either choose to stay at a Resort that specifically is known as a golf resort and has it's on golf course onsite, or you may choose to stay at any resort and get transportation to golf courses in the area. There are lots of mexico golf vacation package options. Some courses will actually offer free pick up and return included in your green fee, or you can provide your own transportation, such as a rental car or taxi. There are five specific resorts that offer golf packages where you can get a great deal by staying at the hotel and golfing there. These are all here in the Riviera Maya. These are, the Iberostar Grand Paraiso Hotel & Golf Club, Mayakoba El Camaleon Resort and Golf Club, Mayan Resort and Golf Club and Moon Palace Resort and Golf Club and Playacar Golf Club. The Iberostar Playa Paraiso Resort and Golf Club is located on Paraiso Beach. This 5 star hotel offers 18 holes on a 6800 yard layout. 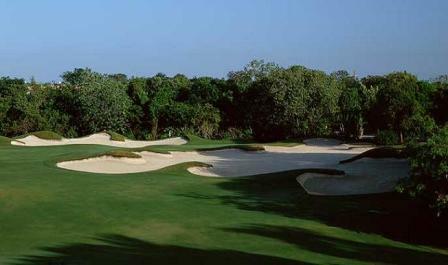 This Riviera Maya golf course was designed by PB Dye. Amenities for golfers include: Food and beverage ordering from course, full service prop shop, restaurant and snack bar. Golf lessons are available if you desire a little expert advice. This top of the line course offers a driving and practice range. A perk is, if you are a guest of the hotel, you receive a free round of golf per person for stay up to 4 nights. You can receive two free rounds of golf per person if you stay at least 5 or more nights. Now, that is a good deal! Not to mention this hotel is just gorgeous and you wouldn't need to worry about taking a shuttle. Don't want to bring your clubs? No worries, you can rent them for $40 (brands include Titleist, Mizuno, Nike). You can also rent Adidas shoes for $20. Green fee rates include: Your cart fee, taxes, snacks and drinks. Here are a few pics of the Iberostar course. 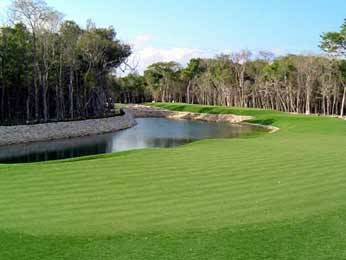 The Mayakoba El Camaleon Golf Course is located on the Mayakoba Resort in the Riviera Maya. This spectacular resort was the first to host the PGA tour in Mexico in 2007. 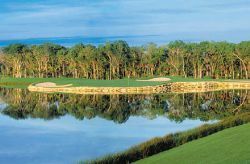 Greg Norman who has won more than 60 titles from around the world designed this one of a kind course. With 18 holes and a 7039 yard unique layout, you are sure to be impressed. The uniqueness of this Riviera Maya golf course is that the course weaves through three different types of eco systems. The tropical jungle, mangroves and breathtaking oceanfront areas. Limestone canals line this course. There is even a cenote on the fairway. A cenote is an underwater cave. Greg made this course great for any skill level by placing a minimum of five tee blocks at each hole. The Mayakoba el Camaleon golf course club house is above the 18th green and next to that is the practice facility and driving range. If you stay at this Riviera Maya golf 5 star resort, you can get a canal front room that allows you to step out of your room into a ferry that takes you to the first tee. Now that is fabulous!! The perfect in golf vacations in Mexico! 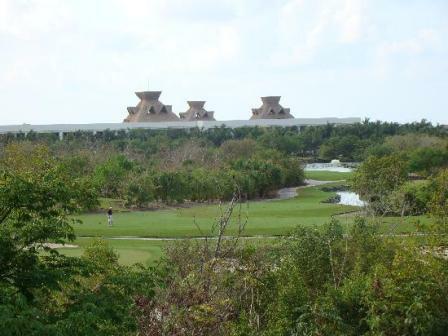 Below are some pictures of the Mayakoba, golf course. The Mayan Palace Riviera Maya Golf Resort is a top of the line resort and course. 18 holes, par 54 and 2923 yards and 28 bunkers on a 5 star resort. 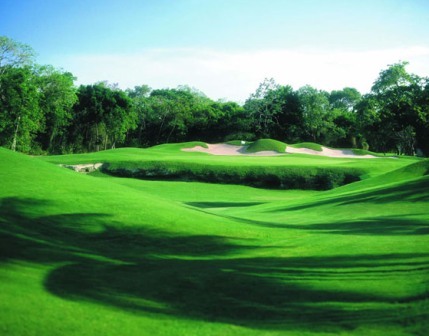 This Riviera Maya golf course is comprised of two lakes, and lots of natural vegetation in the jungle. 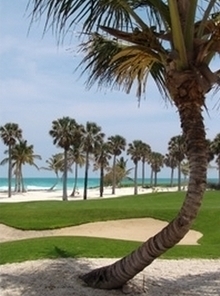 This Riviera Maya golf course opened in September 2003. The resort/hotel offers free transportation, parking, bag storage, pro shop, restaurant and bar. A 5 star Practice range, putting green and short game area. If you don't want to bring your clubs, you can rent clubs and shoes here at the course. If you have visited the Riviera Maya then you know this resort and course are very well known. They take care of their guests very well. 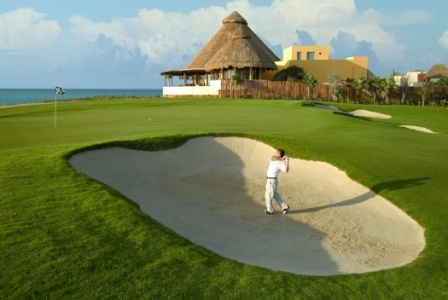 Special Riviera Maya golf packages are available at different Mexico golf resort and courses. Mayan Palace Golf course pictures. Moon Palace Spa and Golf Club is located at the Moon Palace resort in the Riviera Maya. This resort boasts of it's Jack Nicklaus signature golf course where golfers work their way through the wetlands and jungle. There are three 9 hole courses where people of all skill levels can play. These courses are open to the public as well so you don't have to stay at the resort to play. You have two restaurants at the club as well as a place to rent clubs and store them if needed at this Riviera Maya golf club. You can warm up at the practice range, putting and chipping green and shower at the end of your day. Your golf cart is completely equipped with a GPS with exact distancing, electronic scoring, live tournament leaderboard and food and beverage ordering! Below are your green fees. Included in your green fees are transportation, food and beverages at the club house, a shared cart and snacks along the course. When you book a golf package at the Moon Palace, you receive a round of golf daily per room, all the golf amenities mentioned above, use of pool and meals served at the two restaurants. Here is a picture of the Moon Palace, golf course. The Playacar Golf Club is the only Riviera Maya all inclusive mexico golf vacations and resort in the Riviera Maya for Palace resorts. Located in Playa del Carmen, with a course designed by Robert Von Hagge. 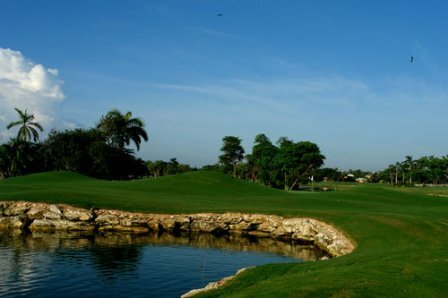 This Riviera Maya all inclusive golf course is surrounded by lakes and lush green vegetation. It is extremely challenging with a 72 par and 7144 yards. There are three Riviera Maya Palace resorts, Spa Palace, Aventura Spa Palace, Xpu Ha Palace. These resorts gets use of this golf course. This all inclusive, golf resort has one green fee and included in that is all food and beverages at the course, items from two beverage carts that come around the course, as well as food and beverages on the 19th hole. Beverage carts are stocked with sandwiches, chips, water, soft drinks and beer. The 19th hole has a grill menu with sandwiches, hamburgers, hotdogs, alcoholic and non alcoholic drinks. This course provides a practice area, pitching, chipping and greenside bunker area.